Family sick and tired of sweating all summer long? Ready to make the move to the 21st century? If so, air conditioning installation is likely in your future. However, it’s not as simple as calling an installer, choosing your unit, and then relaxing in your now-comfortable home. Below, we’ll run through some of the things you need to know before having an air conditioner installed. One of the first considerations that you need to make when it comes to aircon installation is the size of the unit itself. Too many homeowners assume that the larger the unit, the more cool air it can push. That seems to be logical, but it actually does not work that way. You need a unit that is rated for the cubic footage of your home, and no more or no less. If the unit is too small, it will not be able to keep up with demand and will fail prematurely. However, if the unit is too large, the unit will not run often enough, which can cause humidity levels in the home to rise, leading to health issues, and possibly even encouraging the growth of mold and mildew. You also need to consider whether you want to go with a conventional ducted system, or if you want a ductless system. Both have their advantages and drawbacks, but they are very different. A traditional ducted system is usually cheaper, but a ductless system can be more efficient. Make sure that after your air conditioning installation, you are prepared to maintain your home’s air quality. This means using a HEPA filter in the unit, and regularly checking and replacing that filter. If you are unsure about the size of type of filter you need, ask the air conditioning company for their recommendations. Prior to your aircon installation, you should think about your wants and needs when it comes to thermostats. You can go with an analogue, or older programmable model, but you can gain better efficiency, energy savings, and comfort with a smart thermostat that connects to your home’s Wi-Fi. Finally, do not neglect maintenance. It’s highly recommended that you choose air conditioning installation from a company that can offer an annual service plan. This should involve coming to your home twice per year, cleaning the interior and exterior components of the system, checking refrigerant level, cleaning drain pans and lines, and more. All of this is designed to help extend the life of your air conditioner and reduce the costs of operation. 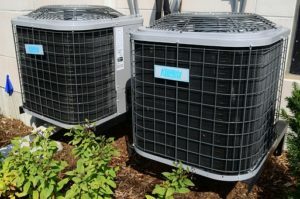 In the end, air conditioning installation is the first step toward keeping your house cool and comfortable at all times. However, you need to be prepared when you go into it. Ideally, you’ll work with an installation and maintenance provider who can help you at each step of the way, from choosing between system types to sizing the unit and everything else.